(P1) Indonesia is the 5th biggest producer of tobacco. Children younger than 15, must not work in Indonesia. It is illegal. (P2) However, around 1.5 children work in agriculture. 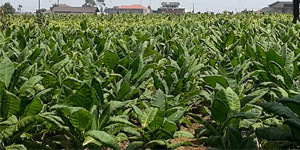 Thousands work on tobacco plantations. (P3) Many have “green tobacco sickness”. They get weak. They get headaches. They cannot go to school. They help their families make money. They make only one dollar a day. (P4) Human rights groups are trying to change this. They talk to big Indonesian tobacco companies. Do children under 15 years of age work in your country? If so, tell about it. Have you ever been to Indonesia? If so, which city or cities? If no, do you want to travel there? Do you think children under 15 should be forced to work? Why or why not? How many children are employed in agriculture?